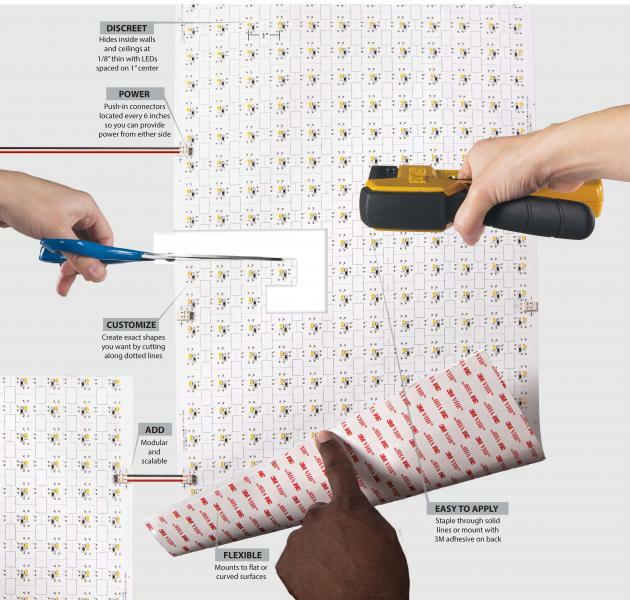 Designed for tailored architectural lighting solutions, WAC Lighting’s Pixels sheets allow designers and remodelers to cut just the right amount they need. Available in modular, customizable 12-by-24-inch sheets, the product has an ultra-thin 1/8-inch profile and is spaced on 1-inch center. Users can mount the pieces to curved or flat surfaces by tacking, stapling, or using 3M adhesive on the back. The luminaires are 0-10-volts dimming and delivers a 90 CRI. Five color temperatures are available: 2700K, 3000K, 3500K, 4000K, and 5000K.